The price includes Delivery, Pick Up and Disposal. An extra cost will be incurred if kept over the week allowed or if dumpster is over the weight limit. Do I need to be at the location when the dumpster is delivered? No, just fill out and sign the “Customer Service Agreement“, describing where you would like your dumpster placed. We will make sure it is put in the proper place. Check or Cash with “Customer Service Agreement” at time of delivery. We also accept Visa, Master Card & Discover on our website. Business customers may apply for credit. See “Credit Application” on the Forms & Documents page. What can't I put in the dumpster? The following Materials are strictly PROHIBITED and, if found, will be returned to the customer. * = PAINTS (LATEX) – Can be disposed of in your local trash service containers as long as you follow this procedure. Remove the lid from the can, in a well-ventilated area (away from sources of heat or flame, or other hazardous materials). This allows the volatiles or fumes to dissipate, so that the latex paint will so-lidify. Once the latex paint is solidified (dry and hard all the way through); the can and latex paint can be disposed of with the general trash. Leave the lid off of the can, so the hauler can see that it is empty. What will happen if I include any UnAcceptable Materials, or Prohibited Items that are found within the Dumpster after pickup? 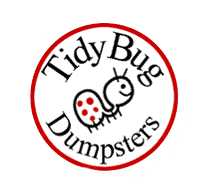 TidyBug will return ANY UnAcceptable Materials, or Prohibited Items to the property location of the dumpster drop-off. If any questions on materials, please Call us at (636) 278-8439 or check our Acceptable Materials page. How can I avoid extra costs? The load must not overhang the width of the dumpster; the load must not exceed top of box, the driver has to be able to cover the load. Material must be EVENLY distributed. If the dumpster is overloaded and unsafe to transport, it will have to be unloaded/made safe by customer and you will be billed for the dry run. If Tidy Bug has to unload and reload in order to transport, the man hours will be billed at $50.00 per man hour. Do not block access to the dumpster; a return trip charge is incurred if the dumpster is not accessible when scheduled for pick up. Will it damage my driveway? In most cases driveways are not damaged. Although the company always use extreme care when delivering and picking up containers, we are not responsible for damage to weak or broken walkways, driveways, etc.